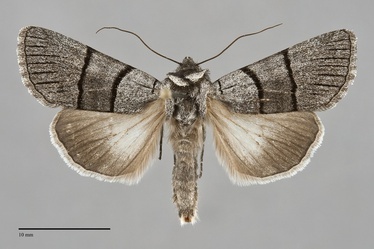 Sympistis barnesii is a distinctive medium-sized species (FW length 16 - 18 mm) with gray forewings marked with thick straight antemedial and postmedial lines that flies near timberline. The forewings are even powdery steel gray, lighter basal to the antemedial line and along the costa from the base to the proximal subterminal area. A thin basal dash is present at the base of the cell. The basal line is thin and black and the antemedial and postmedial lines are thick and black. The antemedial line is smoothly curved toward the base on the costa and perpendicular to the trailing margin. The postmedial line is straight across the wing, perpendicular to the trailing margin. A series of parallel thin black lines are present between the veins on the distal wing. The terminal line is thin, black. The fringe is the same color as the terminal area. The median and subterminal lines and all three spots are absent. The hindwing is pale gray at the base with a broad dark gray marginal band that has an ill-defined inner margin. The veins and thin discal spot are gray. The terminal line is dark gray, and the fringe is white with a gray base. The head is sooty blackish gray, as is most of the collar. The tip of the collar is silvery gray. The rest of the thorax is dark gray. The male antenna is filiform. This species can be identified by the combination of steel gray forewing with thick nearly straight transverse lines. It is unlikely to be confused with any other species in our region. This species is widely distributed in the Cascades and Rocky Mountain region on rocky ridgetops, in subalpine meadows, and in open spruce-fir forests at middle to high elevations. It is usually uncommon. Sympistis barnesii is found in a number of mountain ranges in our area. It occurs across southern British Columbia. The range extends south in the Cascades at least as far south as central Oregon. It is found in the western ranges of the Cordillera, including those in northern Idaho and the Blue Mountains. The range of this species extends south into the Sierra Nevada of California. It also occurs in the Rocky Mountains. No information is presently available regarding larval foodplants of this species. The larva might feed on beardtongues (Penstemon spp.) in the Scrophulariaceae based on the preferences of related species. 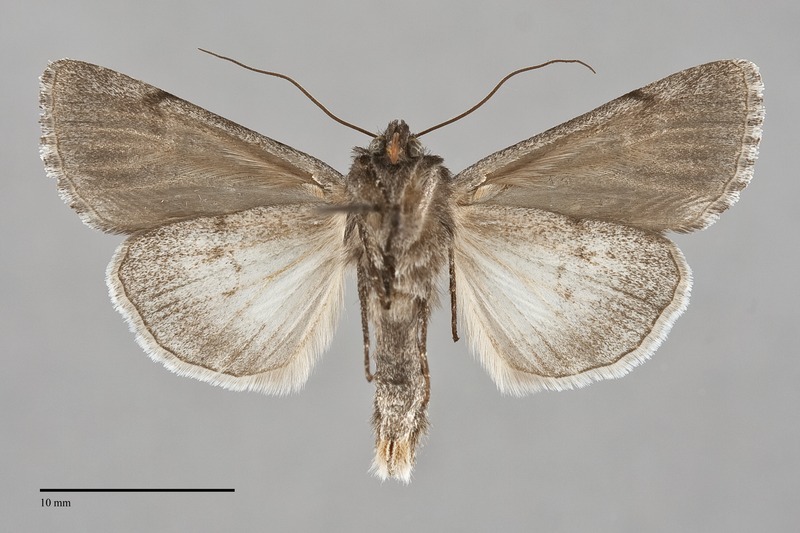 The flight season of this species is mid- and late summer. Most specimens from our region were collected during July and August. It is nocturnal and comes to lights.